Friendship disputes are a common part of childhood. Friendships are important to children just as they are to adults. Friends help develop a child’s social skills and contribute to a child’s emotional well-being. However, friendships can bring their own problems too, and children will experience arguments, break-ups and conflict with their friends. Parents can help by teaching their children the skills they need to handle friendship difficulties. Talk to your child. Let him tell you what has happened and how he is feeling. The American Psychological Association emphasizes that talking and listening is key to a healthy relationship with your child. Let him choose a time when he is feeling comfortable and at ease and try to be available whenever and wherever that is - the Association suggests these conversations may be best taking place at bedtime, before dinner or even in the car. Encourage your child to see the other person’s point of view. As difficult as it may be, try not to be biased. Ask her questions such as "How do you think your friend feels about your argument?" and "Do you think she thought you did something wrong?" Having your child think about the dispute from another perspective may help her to find a solution. Ask your child what he wants to happen and then help him to think of ways that he can do that. Don’t solve the problem for him, but ask questions that give him pointers to enable him to think through the dispute himself and come up with his own solutions. For example, if your child is being teased or left out by a friend, ask him if he would like to find other friends to play with and discuss ways he could make new friends. Dr. Michele Borba suggests talking through some responses for your child to have ready if a friend teases him. If the argument is about playing with a certain toy, or taking turns in a game then ask your child to come up with ways this could be done fairly. This way you will not only be helping him to resolve this dispute, but also giving him the skills he needs to cope with friendship problems throughout his life. 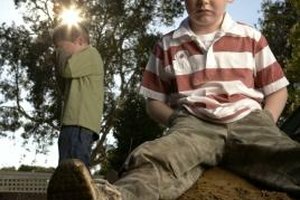 Help your child feel confident when dealing with conflict and friendship disputes. Praise her when she behaves properly and sensibly to reinforce this behavior. Model the correct behavior yourself by resolving conflict at home in a calm manner. If you have a disagreement with your child about household chores or an agreed bedtime, sit down and discuss the problem with her, ask her for her feelings and opinions and discuss solutions together - could she have a later bedtime on the weekend or receive more allowance for doing extra chores, for example. This way, your child will learn that talking and listening and thinking about solutions can help to resolve disagreements. Show your child that resolving disputes through aggression or physical means is unacceptable by speaking calmly and taking turns to listen and talk. Share books about friendship problems with your child – this can help him to understand what is going on and to see that it is a common part of childhood. For young children up to 6, "The Berenstain Bears and the Trouble with Friends" by Stan and Jan Berenstain will help children see that differences between friends can be resolved. For older children try, "Making Choices and Making Friends - the Social Competencies Assets." This book is full of stories and ideas to help children get along with others. Avoid interrogating your child about the issue when she comes home from school. Let her know that you are there if she wants to talk – but don’t make it a huge deal. Sometimes these situations simply resolve themselves and your child may soon have forgotten all about it. Instead, ask a general question such as, "How was school today?" This lets your child know you are interested and gives her the chance to speak about the situation, if she wants to. Encourage your child to have a wide circle of friends – this way a dispute with a friend will not seem as devastating as your child will have others to talk to and play with. Invite friends to come over and play and let your child join groups and clubs where the children will have the same interests. Take your child’s worries seriously. If the dispute escalates and your child does not want to go to school, or if your child is very isolated and unhappy, then consider talking to the teacher.